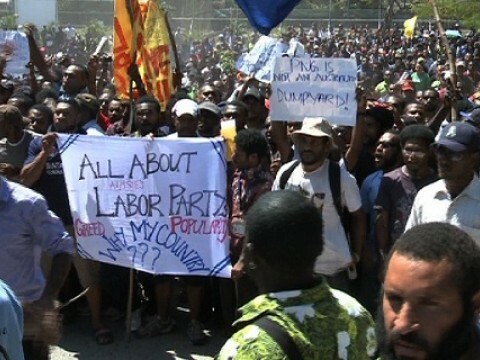 The University of Papua New Guinea students took to the streets of Port Moresby to protest over new asylum deal signed by Australia and PNG. By midday, hundreds of students marched to the university main entrance to display their frustrations over the government’s failure to respond to issues presented to them in a petition, two weeks ago. Among the issues was the recent signing of the Asylum processing deal between the PNG and Australian government. Armed Police and security personnel were on standby as students chanted in anger to cancel the deal. NCD Superintendent of Operations Ndranou Perou advised the students to remain within the university’s perimeter and protest, and they complied. Students’ leading representative Peter Numu said the deal was against the nation’s sovereignty; the people’s power to decide was never exercised. The students burnt a copy of the Asylum deal signed between the O’Neill and Rudd government.